Good day, fellow archery enthusiast, and thanks for stopping by. This article is devoted to TenPoint’s crossbow scopes, so you’ll find out everything you need to know about these optics. We’ll discuss a couple of the top choices you can opt for in a TenPoint crossbow scope, then talk about what to expect from all of the company’s glass. Does TenPoint Produce An Inexpensive But Good Quality Crossbow Scope? Its most basic optics offering, the TenPoint 3X Multi-Line Scope is a great addition to any hunter’s crossbow. It offers three duplex crosshairs calibrated for 20, 30, and 40 yards in a compact package just seven inches long. The mounting rings are included for attaching the scope to a Picatinny rail, and it’s so lightweight that you’ll barely notice it’s there. The main drawbacks are the lack of an illuminated reticle and the use of just fully-coated optics instead of fully multicoated glass surfaces. What Is TenPoint’s Premium Glass? The crème de la crème of TenPoint’s crossbow scopes is the Rangemaster Pro. This is an 8.25-inch aluminum scope with variable speed and arrow crop-compensation settings for crossbows shooting between 275 and 425 FPS. It zooms from 1.5X to 5X, features great light transmission thanks to a 30mm objective lens and fully multicoated optics, and offers an illuminated reticle. Speaking of the reticle, it provides three duplex crosshairs and five dots calibrated for 20, 30, 40, 50, and 60 yards. 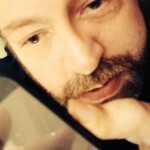 The downside of this premium offering is a bit of fisheye distortion at maximum magnification. Another negative factor here is the price, which is higher than competing products with similar specifications. Does The Company Manufacture Red Dot Sights? Focusing on building terrific scopes, TenPoint has opted to stay out of the red dot sight business. If all you want is a simple dot sight, you should look at other manufacturers. Does It Make Its Own Scopes? TenPoint works directly with an unnamed optics manufacturer, providing the factory with the required specifications and then testing prototypes for durability, accuracy, durability, and ergonomics. Any prototype that doesn’t meet TenPoint’s rigid standards is returned to be rebuilt to TenPoint’s needs. While the crossbow manufacturer doesn’t own the factory that produces its scopes, TenPoint does make sure any glass bearing its moniker lives up to a highly-respected reputation. The only thing I’m displeased about in TenPoint’s scope manufacturing process is that the glass is not produced in the United States. What Are Some Common Characteristics Of TenPoint Scopes? Perhaps the most common feature to TenPoint’s optics is the attention to detail and robustness of the accessories. Unfortunately, that attention to detail doesn’t always apply to the use of antireflective coatings – two of TenPoints three crossbow scopes feature just fully coated optics instead of fully multicoated glass. On the other hand, the two higher-end scopes are available with either non-illuminated or rheostat-controlled illuminated reticles. Finally, TenPoint’s highest caliber of scope is adjustable to match the velocity of most modern crossbows. 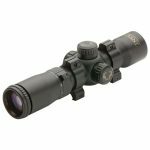 How Good Are The Optics In These Scopes? While the company might skimp on antireflective coating for most of its scopes, it doesn’t cut any corners on the quality of the prisms and other materials utilized in production. Characterized by BaK–4 prisms, TenPoint’s scopes offer good transmittance and little if no phase shift. The only chink in the armor is the fisheye distortion in the Rangemaster Pro. What Kind Of Reticles Does TenPoint Utilize? Each of TenPoint’s crossbow scopes features a different reticle design, but all of them provide range compensation markers for a variety of shooting ranges. The best glass the company makes provides markers for 20 to 60 yards in 10-yard increments. This reticle is etched glass, while the other two models have wire crosshairs instead. Are The Scopes Compact And Lightweight? There are certainly more compact and lightweight scopes on the market, but TenPoint’s products still walk a fine line between offering superb performance and still being small and light enough to be fully ergonomic. None of the three glass accessories breaks beyond the one-pound sweet spot, so you shouldn’t have any problems with a TenPoint scope weighing down your crossbow bad enough to be noticed. The Multi-Line Scope and Pro-View 2 are both fixed magnification models providing 3X zoom. The RangeMaster Pro, on the other hand, is a variable zoom optic allowing the archer to select between 1.5X and 5X magnification. Image clarity, contrast, and crispness (the three C’s of optics) are all outstanding across all three models, with the exception of the fisheye distortion I mentioned in the RangeMaster Pro. 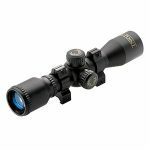 Will I Be Able To Use TenPoint’s Scopes Without Much Light? If you hunt in the early hours of dawn or late minutes of dusk, a TenPoint scope can definitely suit your needs. Only one of the company’s products neglects to offer an illuminated reticle, but two of them reduce transmittance by only having fully coated optics. For low-light conditions, your best bet is the TenPoint Rangemaster Pro with its 30mm objective lens, fully multicoated optics, and excellent brightness settings on the illuminated reticle. TenPoint’s crossbow glass provides a more than adequate field of view no matter which model you choose. Acquiring your target, zooming in on your prey, and even leading the animal when it’s on the move are all easy to accomplish with these scopes. How Easy Are TenPoint’s Scopes To Mount And Sight In? Owing to excellent instruction manuals and simple-to-use controls, the scopes sold by this company are very easy to mount and sight in. The scopes usually include rings for mounting, and the whole process is simple if you follow the correct procedure. If your crossbow has a dovetail mount, though, instead of Weaver or Picatinny rails, you’ll need to buy a set of rings. Sighting in is equally easy, if done right. After mounting the scope, set the speed dial (if equipped) to your crossbow’s advertised velocity and then sight in at 20 yards. TenPoint scopes are waterproof and fogproof, having nitrogen-purged optics chambers and O-ring sealed lenses. While the scopes aren’t rubber-armored, they are nonetheless quite shockproof. Thanks for coming by to see what I think of TenPoint’s crossbow scopes. These are definitely good choices for your crossbow hunting needs, as long as you don’t expect perfect optics from the lower-end products.